Private referral practice Davies Veterinary Specialists (Davies) has proudly donated a big cheque to the charity Medical Detection Dogs. 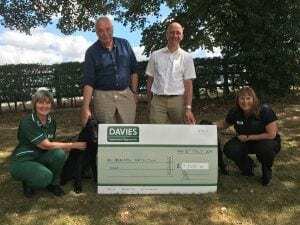 Enterprising team members at Davies raised £4,450 and the practice topped this sum up to an impressive £7,200, which was presented to Medical Detection Dogs this week. Each year Davies chooses a charity of the year and team members collect as much cash as they can for their chosen charity through numerous fundraising projects. Medical Detection Dogs was picked for 2017 because of the strides they are making in helping to detect human diseases early. The charity trains dogs to help people with life-threatening medical conditions and is at the forefront of the research into the fight against cancer. Bio-Detection Dogs are trained to detect the odour of human diseases such as cancer, in samples such as urine, breath and swabs. Medical Alert Assistance Dogs are trained to detect minute changes in an individual’s personal odour triggered by their disease and alert them to an impending medical event. The charity receives no government funding for its work and relies entirely on the generosity of donations from trusts and the public. The charity is a particular favourite with Isabelle Desmas-Bazelle, Oncology Specialist at Davies. She is currently working on a project to find an affordable, rapid and non-invasive diagnostic test for urinary transitional cell carcinoma in dogs by training dogs to detect this cancer type in the odour of the urine. Fundraising events have included Therapy and Fitness Centre physiotherapy evenings, several raffles, three fit team members tackling a tough triathlon, strawberries and cream tea, Facebook charity auctions, the Davies summer party, a sponsored first aid Course, a Bake Off competition, and an incredible solo channel swim. Image: From left to right: Liz Branscombe, Training Manager Davies Veterinary Specialists, Jerry Davies Director and Founder of Davies Veterinary Specialists, Clive Elwood, Managing Director Davies Veterinary Specialists, Tina Kiefer, Marketing Assistant Davies Veterinary Specialists. Davies Veterinary Specialists (DVS) is one of the largest and most diverse small animal veterinary referral centres in Europe. Accessibly based in Higham Gobion, Hertfordshire, DVS employs more than 30 specialist clinicians, a total of 51 veterinary surgeons, 65 nurses, many with an advanced nursing qualification, and 30 administrators and support staff.